An estimated 129 million trees in California are dead. It sounds apocalyptic, but it's true. About one-fifth of those, or 27 million, died between November 2016 and December 2017. More than 60 million died the previous year. Most of the die-off has occurred in the Sierra Nevada, but forests on the Central Coast have lost their own share of oak, pine, and fir stands. The U.S. Forest Service surveyed 4.2 million acres of national forest land between Monterey and Los Angeles counties in 2015, estimating that 2 million trees had died from pest infestations, sudden oak death, and drought. ON FIRE SLO County let a fire that broke out this summer burn to 250 acres because a prescribed burn was planned for the same area later in the week. The U.S. Forest Service says that tree mortality contributes to the risk of fires that burn hotter, faster, and longer. The federal agency has teamed up with Cal Fire and 80 other federal, state, and local agencies and private utility companies to address "forest health," remove trees, increase the use of prescribed fire on public lands, and change the way fire suppression is funded. "Wildfire is the largest risk to our national forest and the watersheds and communities adjacent to it," Los Padres National Forest Fuels Officer Nic Elmquist said. "We're always trying to be proactive and looking for projects that could potentially help with a more resilient landscape moving forward." In 2017 and 2016, six major wildfires touched Santa Barbara County, charring 375,000 acres, burning up 1,133 structures, and killing three people. The largest of those, the Thomas Fire, started in Ventura County in December 2017, burning 282,000 acres between the cities of Ventura and Santa Barbara. The Montecito debris flow followed weeks later in January 2018, killing 20 people (two people are still missing). San Luis Obispo County has had one major fire in that time, the Chimney Fire, which burned 46,000 acres and 49 homes. While the Thomas Fire held the record as the state's largest fire since record keeping began, the Mendocino Complex Fire in Northern California burned almost 500,000 acres this summer. Wildfire is a natural part of the landscape in California, but fires of that size—which burn hundreds of homes, irreparably devastate thousands of acres of land, and kill people—are unacceptable to state legislators like Hannah-Beth Jackson (D-Santa Barbara). At the end of the 2018 legislative session, Gov. Jerry Brown signed two Jackson-authored bills that push for changes in the way public and private lands are managed for fire, development in the wildland-urban interface is addressed, and how residents are alerted about fires that threaten their homes. "What we have to do is recognize the fact that so much of our weather has changed as a result of climate change. ... We're seeing fires in December, which was unheard of before," Jackson said. "We all know that it's happening, unfortunately, the debate seems to be about who's responsible for it. We really do need to recognize that the impacts of climate change are very dramatic on our forests and on our entire ecosystems. We have to be more proactive than many of us would like." Why those fires are so devastating and how to better protect our communities moving forward is an ongoing debate. While California's elected officials and federal and state agencies are focused on increased fuel management techniques such as prescribed burns, environmental groups say the government should be looking at where and how homes are being built. Brown issued an executive order in May 2018 to combat tree mortality and double the amount of land that's actively managed through vegetation thinning and prescribed fire. The California Chaparral Institute pushed back in a letter, saying that focusing on dead trees in forests is misguided because the fires that have been most devastating to California communities had nothing to with those forests. "The unacceptable loss of nearly 10,000 structures and 45 lives in the 2017 wildfires and the losses caused by the 2018 Montecito debris flow have little to nothing to do with forests or the treatment of wildland habitat," the letter states. "Most of these losses resulted from building flammable homes on flammable terrain, not the condition of the surrounding natural environment." The argument—to burn or not to burn—was on full display during the Oct. 2 Santa Barbara County Board of Supervisors meeting, where the Santa Barbara County Fire Department made its case for increasing the use of prescribed fire and vegetation removal as management tools. "Our landscape is covered, particularly on federal land, continuously with large fires over the years," Fire Battalion Chief Rob Hazard told the board. "The extensive fire history in this county goes back decades and decades. We know that large wildfires are a permanent fixture in our county." The fuels, mostly chaparral and grass; shape of the land, steep canyons that face the way the wind blows; and weather, hot, dry sundowner winds with low precipitation, give the Santa Barbara front country a propensity for ignition. Since 2004, the county has had 14 major wildfires on 518,068 acres of land. The biggest fire before that burned in 1993, Hazard said. Between 1955 and 1993, the county had seven big fires that seared 327,563 acres. Hazard attributes the increase in ignitions over the last 15 years to climate and forest management. 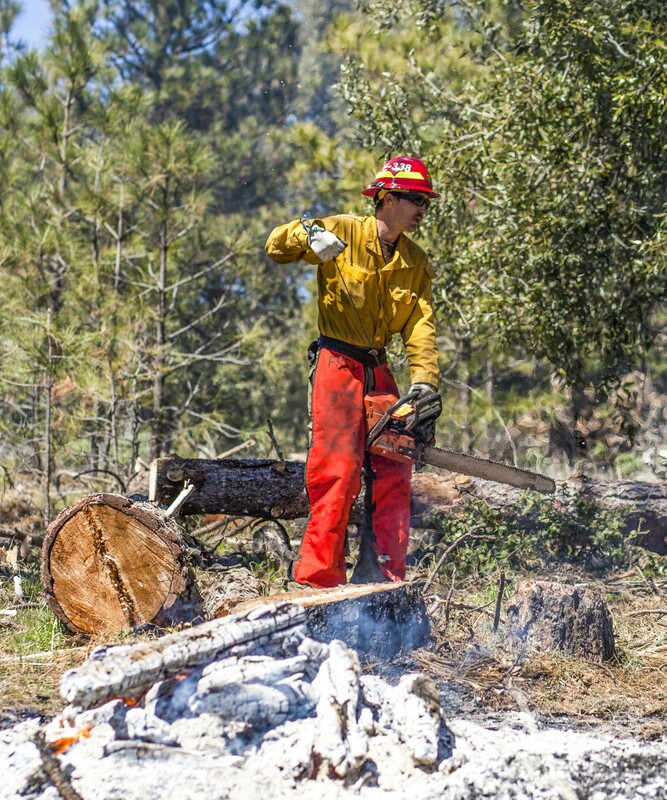 TRIMMING AND BURNING Starting a chainsaw, a U.S. Forest Service crewmember gets ready to saw tree trunks into more managable pieces as part of a pile burn conducted in Los Padres National Forest in April 2018. Santa Barbara County had a very active prescribed fire program from the 1950s to the 1980s, Hazard explained, when about 10,000 acres a year of mostly grass, sage, and scattered chaparral was burned. It reduced the age class of vegetation, reduced the amount of dead fuel, and restored fire-adapted ecosystems, he said. As a way of explaining the impact of vegetation age, Hazard said that when the 2016 Rey Fire met with the area where the 2007 Zaca Fire had burned, it went out. "Fires interact positively with previous burns. They literally stop right on the edges of those burns," he said. "Up to about 20 years, we see this interaction." Dead fuel builds after that, becoming more flammable, Hazard said. Fire danger increases from there, as does the inclination for hotter, faster, longer burning fires that are hard to put out. $1.8 billion in property losses. Jameson Reservoir is unusable. Montecito's water supply and watershed are damaged. And the area will likely need to be evacuated this winter and next during heavy rains. In order to prevent disasters of that magnitude in the future, county fire proposed targeting communities that are at a high risk of experiencing a wildfire and completing community wildfire protection plans in those areas. Plans include field treatments between defensible space and the wildland, creating defensible space (100-acre buffer around homes), hardening homes (replacing flammable materials), removing ignition points (such as wood piles), and educating communities about inspection, enforcement, and evacuation. Los Padres National Forest treats approximately 2,000 to 4,000 acres every year. County fire has completed fuel treatments on 648 acres of land since 2004. The department has plans to treat less than 2,000 acres. Hazard said that's less than 1 percent of what's burned in the last 15 years. It would consist of working with small amounts of vegetation management in strategic areas—alongside roads, ridgelines, and in forested areas that could help in the event that a wildfire does break out. Tepusquet resident Renee O'Neill, whose community has suffered close calls multiple times over the last 15 years, spoke during public comment at the Santa Barbara County Board of Supervisors meeting, saying that a plan to do something more in terms of prevention is long overdue. "I'm all for prescribed burns in the right conditions," she said. "The Chumash Indians used to do this on a regular basis. ... Prescribed burns aren't something new." She said she watched Los Padres ForestWatch shut down a prescribed burn in the Tepusquet area with the threat of a lawsuit. Luckily, O'Neill said, enough of the burn had already been completed to prevent the "La Brea Fire in 2008 from annihilating our community." Andy Caldwell with the Coalition for Labor Agriculture and Business accused the environmental community of putting lives in danger with its crusade against fuel management on state and federal land. "They need to be called out," he said. "We are disappointed that now that we're into the next rainy season, we don't have direction, we don't have a firm commitment." "When I bought my house 18 years ago, I never knew I was moving to a fire-prone area," August told the board. She said the Windmill Fire nearly destroyed her home between Buellton and Los Alamos. "We can do a lot more to ensure that people are safe and that their homes survive a wildfire. ... I can't thank you enough for protecting my family, my animals, and my friends." 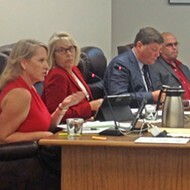 Bryant Baker, ForestWatch's conservation director, followed August in public comment, saying that the county needed to look at a range of options including targeted vegetation removal, curbing new development in fire-prone areas, and reducing human-caused ignitions. "I agree these issues should not be controversial," he said. "These issues should be science-based. ... 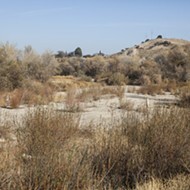 There are some types of vegetation treatment that have no place in chaparral. Prescribed fire is one of them." Janet Wolf, Santa Barbara County 4th District supervisor, pleaded with the room to come together. She said she lost everything in the Painted Cave Fire in 1990, and it was difficult for her to listen to groups being pitted against one another in the aftermath of one of the worst disasters in county history. "It's really disheartening for me because I think we all know that we don't really want this to happen and we don't want this to devolve into two different camps. We really need to be coming together," Wolf said. "I just hope the tenor of all of our discussions is that people are well-respected and that we can get to a point again where we can do an 'all of the above' strategy." SLO County has had an active prescribed fire program since the 1930s, according to SLO Cal Fire spokesperson Chris Elms. "We don't just go out and burn anything," Elms said. "These burns are planned out months, maybe years, ahead of time." He said that wildfires gain strength as they burn, and firefighters have to work against factors such as slope and wind when battling blazes. The goal with prescribed fire is to keep them low intensity while still burning the fuel that they're trying to get rid of—which include invasive weeds, dead brush and trees, and overgrown vegetation. Elms said the fire department will trim back branches so the fire stays low. If too much smoke accumulates, they can slow it down. "The biggest thing that we get is: 'Why are you doing this now?'" Elms said. "Unfortunately, on the Central Coast, our good burning window is usually right in the middle of fire season." 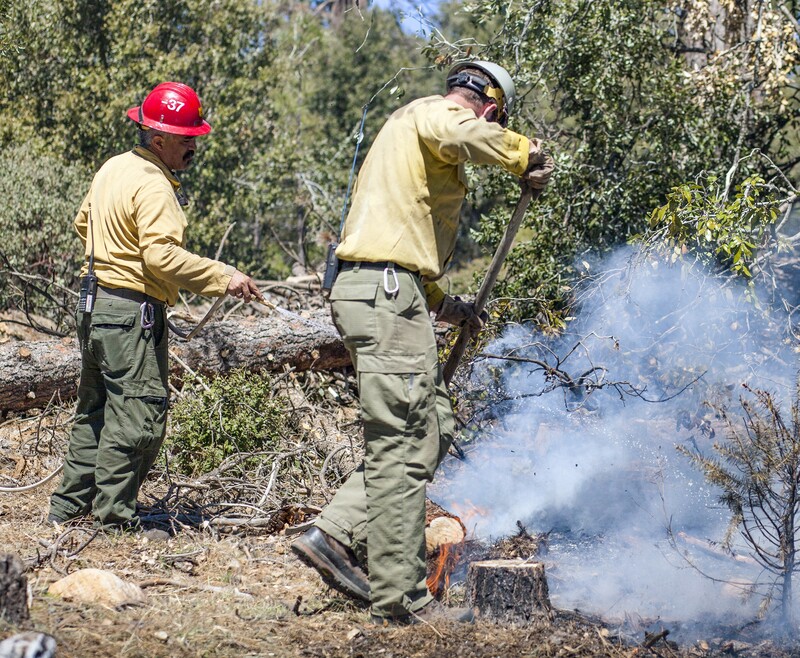 PRESCRIPTION U.S. Forest Service crew members work on a controlled burn in Los Padres National Forest in April 2018. The work included clearing brush and curing wood for small pile fires. Once reduced to ash, they are doused with water and mixed back in with the soil. In the winter, vegetation is often too wet to burn effectively and emits a lot of smoke. The conditions have to be just right for a prescribed burn. 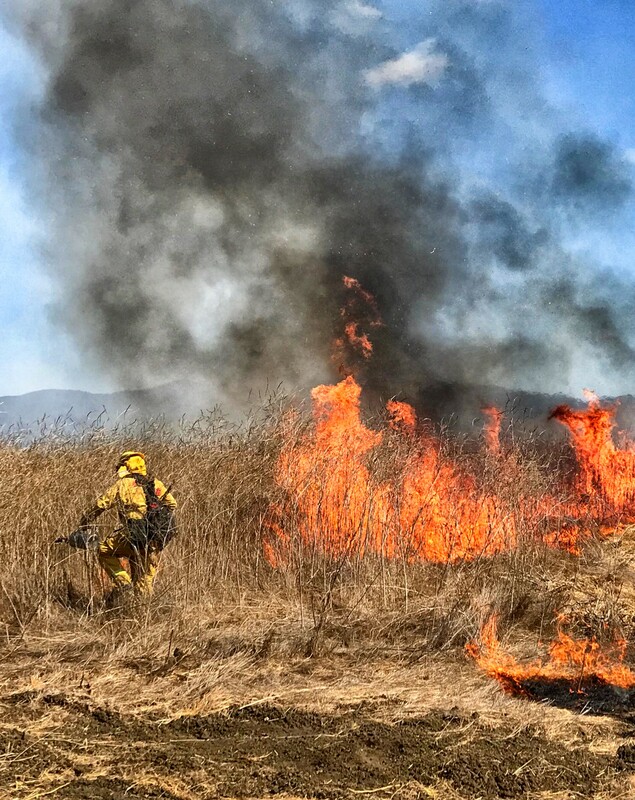 If the wind or temperature changes, or if the fuel moisture in the vegetation is too low or too high, they'll call off a prescribed burn, said Dan Falat, the district superintendent for SLO County's coastal State Parks. "If we don't get the right lift or the right wind conditions, we have to cancel the whole thing," Falat said. "We probably cancel more than we burn because of the natural conditions that we have." Planning those burns takes a lot of work and resources, Falat said. The SLO County Air Pollution Control District has to approve smoke management plans, there has to be an environmental review, State Parks has to coordinate with Cal Fire and other agencies or private landowners. 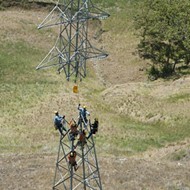 With State Parks resource management techniques, Falat said they try to work with the environment, reducing the amount of fuels on the ground, so that ladder fuels don't push fire up into tree canopies such as the Monterey pine stands in Cambria. That way, if fire does run through an area, it's not going to wipe out entire hillsides. "It reduces the temperatures of the fire, reduces amount of damage even if it burns. A lot of these native plants, they either germinate or they are used to California fire conditions, but if you have higher fuel loads, it creates higher temperatures which creates more damage, not to mention [the ability] to control it," Falat said. Right after it rained in early October, SLO County Cal Fire cleared and conducted pile burns of French broom, an invasive brush growing along both sides of Cambria Pines Road. Alan Peters, the unit forester for county fire, said clearing about 4 acres of brush produced 600 piles of the non-native plant. "You're supposed to either burn it or leave it in place and let it rot," Peters said. "We didn't want to just cut it and leave it because we were obviously trying to reduce fire danger." Between 500 and 4,000 acres of SLO County land gets treated with some form of management every year: Some of it's prescribed burn and some of it's trimmed, piled, and burned. 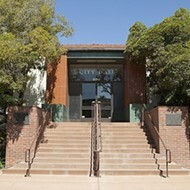 Peters said county fire works closely with the SLO County Fire Safe Council, which recently received four grants totaling $3.8 million. The money will be used for vegetation management countywide and in three specific areas with high fire risk: the Cambria pine forest, Nacimiento Lake, and Park Hill (southeast of Santa Margarita). "When we burn, it usually grows back right away. But the big difference is, since the burns are planned for strategic locations, rather than having a 60-year-old stand with old growth and tons and tons of underbrush, it's new," Peters said. "It completely changes how wildfires react." The recent push from state elected officials and agencies will allocate more resources to local fire departments to conduct burns, Peters said, which means that California residents will likely see an increase in prescribed burn activity. He attributes some of the upper statewide movement to a study published by the Little Hoover Commission in February 2018. "California's forests are reaching a breaking point. Poor management policies that interrupted the natural and historical cycle of fire, combined now with a changing climate, have left forests vulnerable to disease, insects, catastrophic fire, and drought," the commission wrote. "California spends all too much for the immediate, emergency consequences of its long-neglected forests. Massive landscapes once sustained by beneficial, low-intensity wildfire are overrun with fire-intolerant fuels and thick carpets of forest fuels that can turn even the smallest campfire into a raging firestorm." Peters said the state's Cal Fire director instructed an increase in prescribed burning in the coming years. 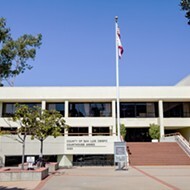 The California Air Resources Board is doing the same with the state's Air Pollution Control Districts (APCDs), giving them more money and equipment to work with local fire agencies on controlled burns, smoke monitoring, and weather forecasting. SLO County APCD Control Officer Gary Willey was at a conference during the week of Oct. 22, and said they had a presentation with the Forest Service, Cal Fire, and the Air Resources Board on the topic of prescribed fire. "We recognize the need to reduce that fuel load," Willey said. "We're finally putting some money toward it." Willey said the biggest issue at the state level is definitely in the Sierra Nevada with all the dead trees, but that all districts will see an increase in burning. Therefore, residents will also see an increase in smoke, which the APCD is responsible for monitoring. "From a health perspective, having these wildfires is a huge health impact. They can happen anytime without warning," Willey said. "You get less smoke with a prescribed burn than you do with a wildfire per acre burned." Santa Barbara County APCD spokesperson Lyz Hoffman said wildfires put off as much as three times the amount of pollution as a prescribed burn does. Another benefit to prescribed burns, Hoffman said, is the APCD's ability to notify the public ahead of time. That way people with health conditions who could be impacted by smoke have time to prepare. During the Thomas Fire, Santa Barbara, Goleta, and parts of Lompoc had unhealthy or very unhealthy air for almost two weeks. Hoffman said the increased focus on prescribed burns is a way for the state to stave off or minimize impacts such as unhealthy air. Prescribed burns aren't the answer, though, said Jeff Kuyper, director of Los Padres ForestWatch. "The overarching theme is that our communities need to take a comprehensive and holistic approach into protecting ourselves from wildfire, and so we can't really depend on one approach, and so we need to look at what the science tells us is the most effective way to accomplish that," Kuyper said. "The most effective way to protect communities from wildfire is to start from the home and work outwards." The automatic reaction, Kuyper said, is for local decision makers to simply say that they need to clear more brush to protect communities, but that approach lulls communities into a false sense of security. 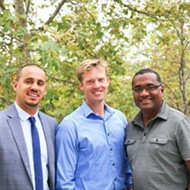 ForestWatch Conservation Director Baker said that he sees some California communities taking the right approaches. Monrovia, on the edge of Angeles National Forest, has a robust community wildfire protection plan that focuses on creating defensible space around homes and making sure that people have the resources to fireproof their homes. This includes putting ember-proof screens on the outsides of homes and replacing shake roofs. "When a home burns, it becomes a source of embers for much longer than when vegetation burns," Baker said. "It can burn for an hour or more that's kicking up embers that's raining on all these other homes." August, who does public outreach for ForestWatch, added that a home that's not fire resistant in a neighborhood is a liability.